Our Sunday School classes meet at 9:45 am on Sunday morning. Classes are available for all ages and in a variety of class styles and structures. Take a closer look below for our range of classes. For more about any of our Sunday School classes, contact the church office. Classes for our children are divided by age/grade, with developmentally age appropriate activities and lessons. Preschool classes focus on offering a loving environment and introducing children to key Bible stories and concepts. School-age classes include elements of Bible memorization and life application of Bible lessons. All classes in this department are co-ed. A time of close bonding which begins each Sunday with a light breakfast and fellowship. Grades 7 & 8: Prayer requests, updates, and a Bible centered lesson that often focuses on application. Grades 9 -12: A safe place to share life experiences without being judged. Students feel the love of God and learn to love others. Each Sunday involves prayer, a short lesson, and a good amount of group discussion on a variety of topics. Friends of Jesus: A co-ed class for developmentally disabled people from ages 16 through 116 that enjoys singing, fellowship, and fun. For more on this class, see our Special Education ministry page. The Bridge Class: A co-ed class of couples and singles with discussion-style Bible study, covering a variety of biblical texts and relevant topics. Couples Class: A co-ed class that enjoys Bible study and fellowship. The Susan Welsh Class: A class of ladies of all ages with lively lecture/discussion type lessons. The Rupert Collins Class: A group of men consistent in their faith in God and interactive in the study and discussion of lessons, and constantly involved in missions projects. 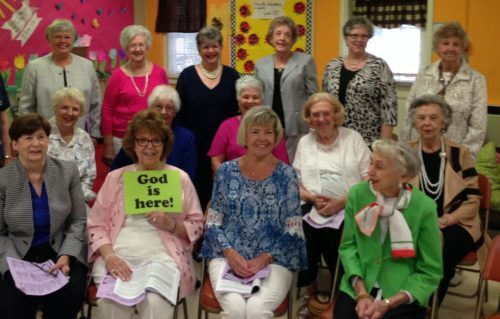 Circle of Friends: A ladies’ Bible study for all ages with class participation through discussion, sharing in church and community needs with missions projects year round. The T. E. L. Class/Ladies’ Fellowship Class: A ladies’ class with lecture style lessons and discussion. Care group ministry divided into six groups with special designated weekly prayer emphasis. The Fellowship Class: A co-ed class for all ages, with a lecture type lesson, fellowship time and singing familiar hymns.